My friend Brian and I share a plot at a local urban garden. We’ve planted carrots and broccoli and cabbage among a few other things. Brian’s been growing herbs over at his apartment but I was too scared to try herbs. Until recently! I saw that there was wild mint growing near the water hoses at the garden – many different varieties of mint! So I asked the garden manager if I could dig some up and take it home to grow on my balcony. He said yes! 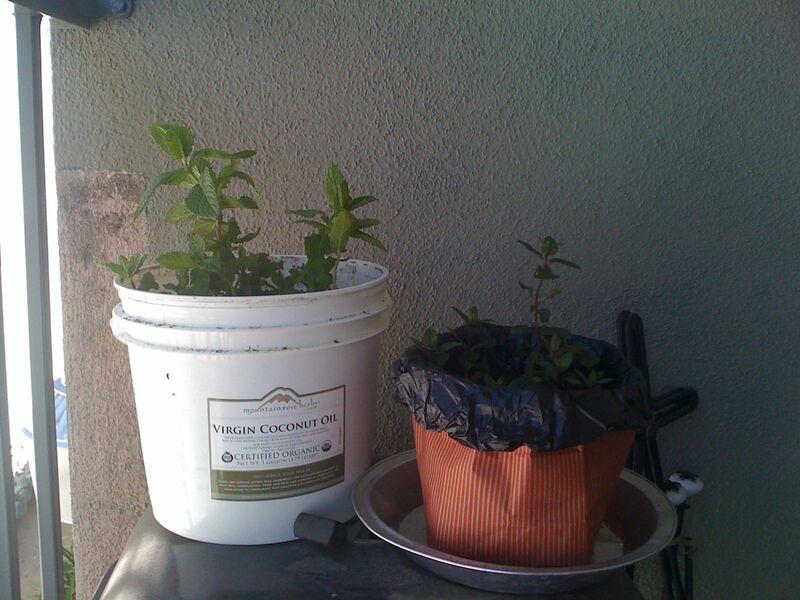 Last weekend, I pulled up some regular mint and some chocolate mint and using the leftover dirt from Brian’s herbs, I transplanted the regular mint into an old coconut oil bucket and the chocolate mint into a plastic bag-lined paper bag on a tin pie plate. Then I watered them both well. Over the last few days I’ve been checking the dirt and pulling off dead leaves so the plant can give energy to the live leaves. And today! Today I noticed that the live leaves no longer feel wilted! They’ve livened up! The roots have started to grow! The transplant was successful!! I know it’s only mint and mint is hardy and it was likely to succeed. But I’m still excited. Homemade Ginger-Mint Looseleaf Tisane for me!! I wouldn’t touch that blog with a ten-foot pole! The Weinsteins have gathered enough financial backing to make a bid to take back their company, in a Steve Jobs-inspired move. Something sentimental in me is feeling happy for them. Another part of me is jealous. A third, more complicated part of me thinks this might be good for the middle ground of the indie film industry. What happens next? It’s a good thing. I consider it mother nature’s vaccine. I like to play in it. Grow stuff in it. And sling it at that cute boy I married. We can tend to sometimes think of dirt as dead. Ashes to ashes and dust to dust, ya know? But dirt is a community of organisms. It’s alive. And we’re killing it. Modern agricultural practices are eating away at our soil. One of my favourite food bloggers linked to a new film called, you guessed it, DIRT. Just like FOOD INC, KING CORN, and BIG RIVER were all films worth talking about, DIRT is worth our time. Many people have trouble figuring out what the labels mean on their egg cartons. Which types of eggs should we buy? If you’re confused, check out this great article from About.com. 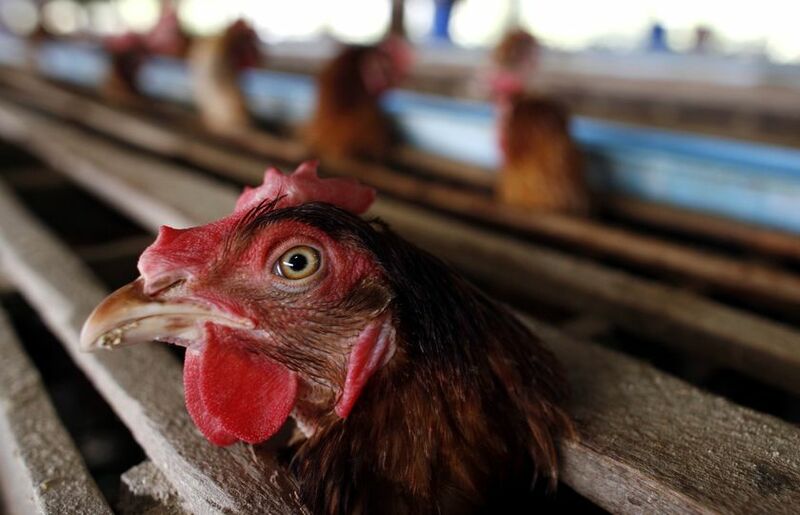 The advantage to pasture-raised eggs is that the hens are able to eat a wide variety of the natural food of chickens — greens, grubs, etc. Not only do many people find these eggs to be much tastier, but there is accumulating evidence that the eggs from these hens have better nutritional profiles — less cholesterol, less fat but more healthy Omega-3 fat, and more of other nutrients such as Vitamin A, lutein, vitamin E, and beta-carotene. Personally, I like to buy pasture-raised eggs. But when I can’t get to the farmers’ market, I buy organic omega-3 eggs (humanely-raised, if possible). I little over a year ago, I wrote about how stevia had been approved by the FDA for human consumption. I’ve been using stevia for about five years now and so-far-I-haven’t-had-any-problems. A day or two ago I came across this little tidbit on a paleo blog I read. And I wanted to share. There’s some scientific evidence to support the notion that Stevia is safe, even in type 2 diabetes patients1, 2. Furthermore, it has been demonstrated to have antihypertensive properties, as shown by Chan et al.3 and a long-term study4. The bottom line is that Stevia seems to be safe, but we need more research to rule out possible side effects. Yay! Stevia = safe! But hmmm… Could there be side effects? Wonder what those could be… Perhaps it’s best to continue to use stevia in moderation, eh? The great thing about this post too, is that they list references. Gregersen S, Jeppesen PB, Holst JJ, Hermansen K. Antihyperglycemic effects of stevioside in type 2 diabetic subjects. Metabolism. 2004 Jan;53(1):73-6. Barriocanal LA, Palacios M, Benitez G, Benitez S, Jimenez JT, Jimenez N, Rojas V. Apparent lack of pharmacological effect of steviol glycosides used as sweeteners in humans. A pilot study of repeated exposures in some normotensive and hypotensive individuals and in Type 1 and Type 2 diabetics. Regul Toxicol Pharmacol. 2008 Jun;51(1):37-41. Epub 2008 Mar 5. Chan P, Tomlinson B, Chen YJ, Liu JC, Hsieh MH, Cheng JT. A double-blind placebo-controlled study of the effectiveness and tolerability of oral stevioside in human hypertension. Br J Clin Pharmacol. 2000 Sep;50(3):215-20. You are currently browsing the Club Fritch blog archives for April, 2010.